Hi everyone. 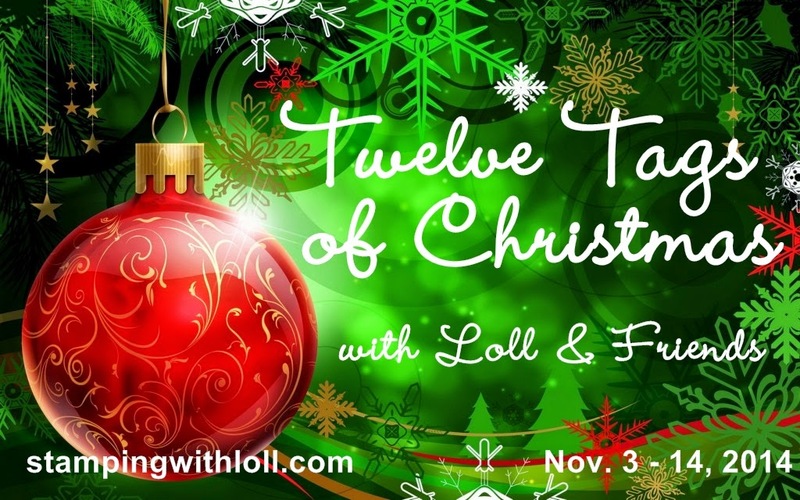 Back today with the winner of the Twelve Tags of Christmas event. I have to say that it turned out better than I could have imagined. So many fabulous entries from many different crafters. "All of the entries for the 12 Tags of Christmas event are stunning. I am especially impressed by how all of the participants have embraced and experimented with mixed media techniques. With so many exceptional entries, it was certainly a challenge to select a winner for Mom's 12 Tags of Christmas Event. Congratulations go to ... "
"Linda's tag is a sophisticated twist on the traditional red, green and gold Christmas palette. 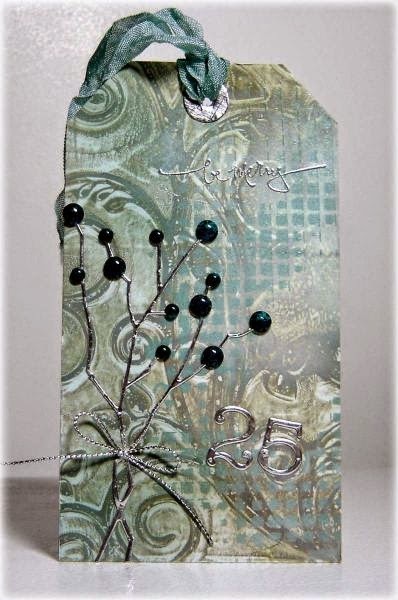 Her tag is well-blanced, perfectly composed, and exceeds the mixed media requirements with the layering of modelling film, frosted film, stain spray, chunky embossing powder, gemstones and organza ribbon. Well done, Linda!!" 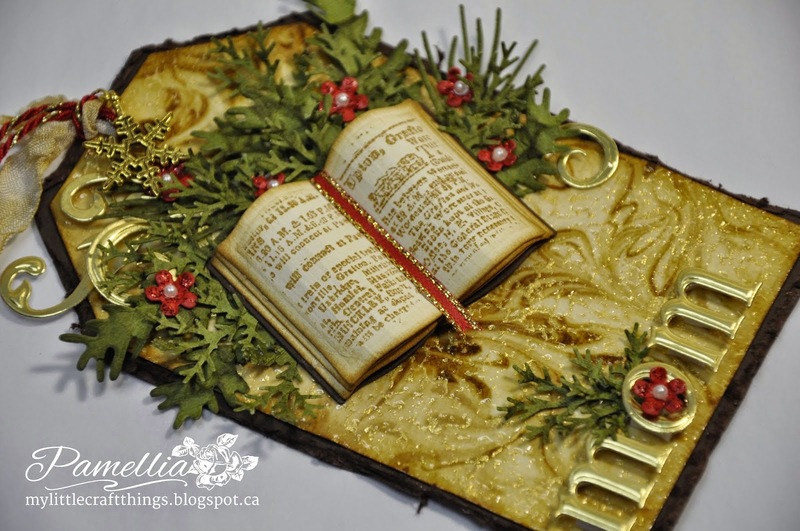 "Honourable mentions go to the following participants for their noteworthy entries ..."
Linda, please email me at stampingwithloll@gmail.com to claim your prize of $40 gift certificate to STAMPlorations! Thanks to everyone that entered. I hope you had fun making your mixed media Christmas tags. 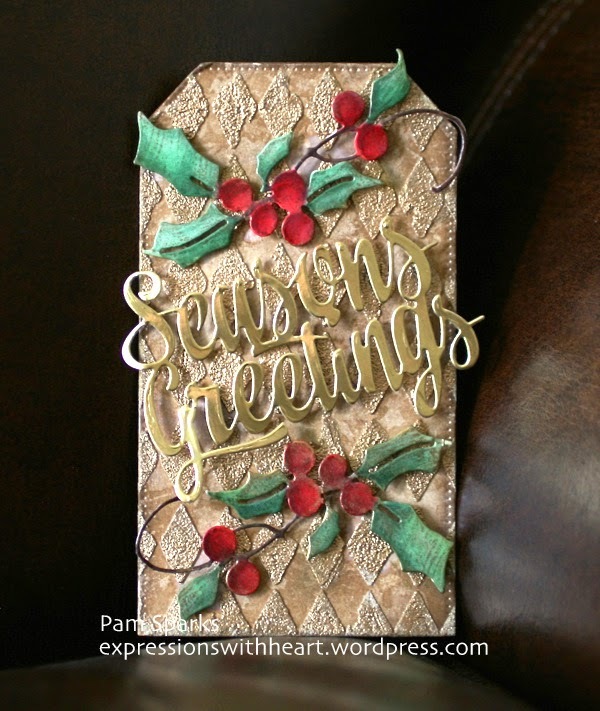 There's so much amazing inspiration in the gallery and from my guest designers and hope that you'll find yourself wanting to make more tags for this upcoming holiday season. As I mentioned before, I have created a board on Pinterest. It's a great visual to see all the tags displayed together ... hope you'll check it out. Great choices! Fantastic event and a fantastic finale! Congratulation to Top Tag! What a beautiful collection of tags! Loll, thanks for hosting this! They were fabulous and fun to see! What a delightful selection of winning tags, each one exceptionally gorgeous and innovative. Congratulations to the winner and highlight tags, and also to Judge Jeremy, who met his 'challenge' with a keen eye and design expertise. All the tags in the gallery are fabulous; an abundance of inspiration, indeed. An all-around awesome experience...so glad to have made my first steps into mixed media as a result of all the 'sparks' that emerged from this series. Already looking forward to making more tags for other occasions and seasons! Big congrats....I think they are all winners. Thanks to your too MF for hosting this fun challenge. It really helped get me motivated to make a few. Awesome Loll! Thank you again and congrats to Linda with her gorgeous tag! Thank you for the honor of being in the mentions! wow! I will have a silly grin on my face all day! Awesome entries! I'll be going back again and again to enjoy these tags and garner inspiration! Thanks to Jer for being the judge. All the tags were so beautiful! Beauty :-) Congratulations to Bonnie, Nancy S., , Pam and Pamela for honorable mention too. Oh my goodness ...... I'm absolutely thrilled, and honored to have one of my tags chosen as the winner. Thank you so much to Loll for hosting such a fabulous challenge, I had a ball! Thanks to Jeremy .... judging must have been a tough job, all the tags were stunning! And thanks to everyone for their lovely comments ..... I had so much fun! Congrats too, to all the HM's .... they're all well deserved! Congratulations and many thanks to you too Loll for hosting the best holiday tag party on the block! It was filled with awesome fun! Looking forward to doing next year! Congrats to Linda and to all those who received HM for their tags! Every one of these tags are absolutely gorgeous! WTG, ladies! I do hope to play along next year, Loll...thanks for all of your hard work, and for sharing this with us! Congratulations to Linda for a well-deserved win - it is a gorgeous tag! And also congrats to the Honourable Mentions too. Loll, thanks so much for doing the 12 Tags event - it was such fun to see the tags each day, and I learned a lot from reading how people did theirs. And thanks to Jeremy for judging it for us!! Looking forward to next year! What a fabulous way to start my Christmas Holiday!! Thank you so much for giving my tag an honourable mention, my Mom is going to be just as thrilled and honoured as I am! Congrats also to Linda, Nancy, Bonnie and Pam, gorgeous tags by all! All of them so beautiful, congratulations to the winners..well deserved! Congrats to all the winners! what wonderful inspiration all around! no one has an excuse now for not having a design for making a tag - that's for sure!!! All these tags are so gorgeous!